That’s the cockroach in the lower left hand corner of the photo which has gone viral. Gee. I wonder who wanted to kill him? He also seems high on Captagon. Deputy Secretary of the Ba’ath Party Regional Command, Hilaal Al-Hilaal, meets with residents of Bani Zayd after its liberation by the Syrian Army and its allies. Dr. Assad requested his presence there and in Al-Layramoon and Al-Ashrafiyya there to assure the citizens of the continuing concern for their well-being. 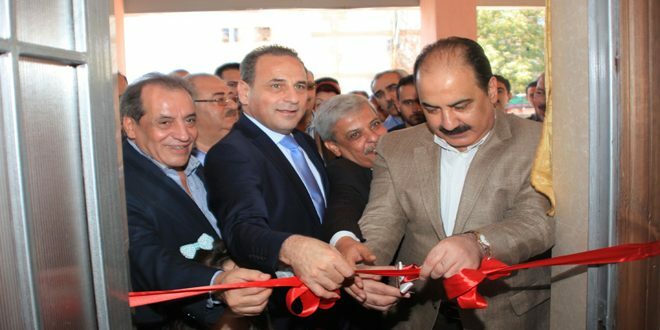 Comrade Al-Hilaal, seen here also helping to inaugurate the opening of the brand new Medical Complex for the Physician’s Union in Al-Hamdaaniyya. Abu Muhammad Al-Jawlaani, a native of Dayr El-Zor, but, whose nom de guerre is meant to throw off those who try to pin down his actual origins. His real name is Usaamaa Al-‘Absi Al-Waahidi. He claims to have disconnected his group, a Robert Ford creation called Jabhat Al-Nusra (The Front for Assistance), from its mother organization, Al-Qaeda. The gesture is most certainly related to the SAA’s conquest of Aleppo and the seemingly endless numbers of defectors from his criminal enterprise. His televised speech was taped and delivered in Jordan. Syrian residents of Bani Zayd and other recently liberated quarters of the northern capital have begun leaving the area in large number through 3 corridors established for them by the government. Initially, the rodent terrorists would not permit them to leave and persisted in sniping at families carrying their only moveable property. After 3 days, when the rats took note that Syrian members of terrorist gangs could actually be granted amnesty, they relented and stopped sniping. Some stories are emerging about former terrorists turning their guns on foreign rodents who were not willing to consider surrender. Of course, as you all know, the SAA turns foreigners over to the militias for “dispensation”, so to speak, after they have been interrogated. The majority of civilians are passing out of Bani Zayd through the Salaahuddeen Quarter and into safety. The number of Syrian terrorists who have surrendered has just passed the 400 mark as I am writing this article on Sunday, July 31, 2016, at 10:20 EDT. “Urgent: do not accept the friendship of ” Elvira Visca “,” Veronica Fernandez ” and ” Paul monasterolo “, They are hackers. Tell everyone on your list because, if someone adds, get the list of contacts and the computer and IP address.